A Look into the 15th Annual Legislative Fly-In to D.C.
By: Isamar Escobar and Ravi Shah, P.E. 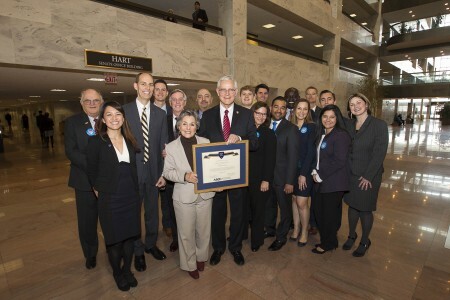 ASCE’s 15th annual Legislative Fly-In took place in Washington, D.C. this past March. This is an intensive two-day program that provides participants with an inside look at the political process. ASCE members from all over the country visited nearly 250 members of Congress to share the civil engineering perspective on transportation funding and reauthorization, and funding for water resources programs. The main focus of this year’s event was to bring awareness to the lack of appropriation for the Water Resources Reform and Development Act, passed last year, and the need for Congress to pass a long-term transportation bill this year. The Fly-In included several key speakers prior to legislative visits on Capitol Hill, including a speech by Peter Rogoff, acting under secretary of transportation for policy at the U.S. Department of Transportation (DOT). Rogoff thanked the attendees for sharing their expertise with lawmakers. In his remarks, he stated that 32 short-term extensions of MAP-21 have caused local and state leaders to “lose their vision” to plan long-term projects, which are what America needs most to be ready for future population growth and demographic trends. He continued by saying the DOT is focused on working with Congress to increase investment in transportation infrastructure, warning that "if we don't change course, it's dismal." These sentiments were shared amongst the crowd as the need for a sustainable long term bill was a key discussion point during these legislative meetings. Additionally, ASCE’s Government Relations Committee conducted briefings on the legislative issues, which proved to be effective not only to newcomers, but to all levels of experienced members. On Wednesday, ASCE members had the opportunity to hear from Representative Earl Blumenauer, who highlighted the need to fix the Highway Trust Fund, commenting that “No nation became great building its infrastructure nine months at a time.” The group then headed to Capitol Hill to visit their United States Senators and Representatives. The Orange County delegation, consisting of Amber Girard, Isamar Escobar and Ravi Shah had the pleasure of meeting with the office of Senator Barbara Boxer, Senator Dianne Feinstein and Representative Mimi Walters and discussed key legislative issues including the Update, Promote, and Develop America's Transportation Essentials (UPDATE) Act, Surface Transportation Authorization, and Water Resources Reform and Development Act (WRRDA) implementation. This included offering their expertise on infrastructure projects while urging their elected officials to identify a reliable, sustainable funding solution to the Highway Trust Fund, and completing work on a multi-year reauthorization bill for the nation's surface transportation programs that will expire this summer. The state of California was one of the most represented states while the group consisted of various levels of experienced members from people who had attended the event in the past, to individuals attending their first legislative fly-in. This was a great opportunity to meet members from across the country and to share ideas, concerns, and solutions. In the photo below, the California delegation along with Society President Robert D. Stevens, and Executive Director Thomas W. Smith III honored Senator Barbara Boxer with an ASCE Honorary Fellow for her many dedicated years of leadership on infrastructure issues. ASCE Orange County Branch members pictured include Isamar Escobar of Michael Baker International, Amber Girard of ARCADIS U.S., and Ravi Shah of Vanir Construction Management, Inc. in the front row, second, third and fourth from right respectively.